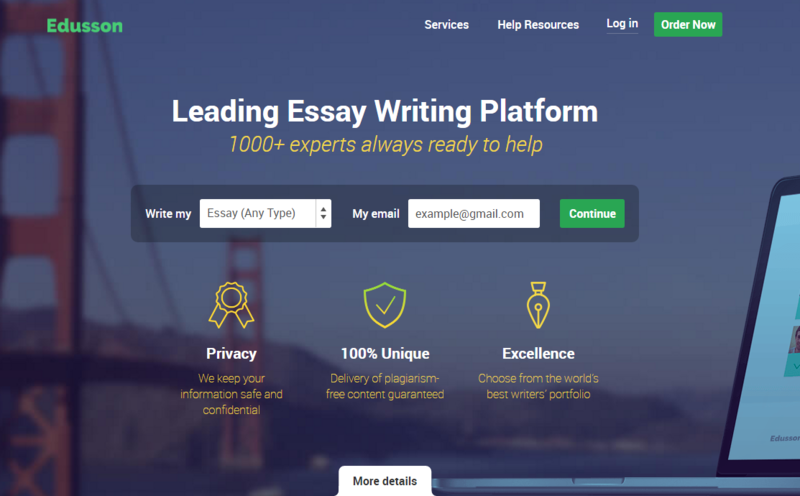 Unbiased edusson.com Review – Can You Get Reliable Writing Help? If you have searched for homework help online, you may have come across edusson.com. This website is designed to bring students and professional writers together. Here you will find an objective and thorough evaluation of the services on offer. Let’s begin. The service provider claims that the services on offer are completely legal. Indeed, it is not a crime to have someone write your paper for you. The company behind the website is based in Cyprus and while a legal address is provided, there is no information on its registration. The reputation of the site on the web is good. You can order most types of papers from the Edusson website. These include essays, case studies, book reviews, research papers, scholarship essays, lab reports and research proposals, to name the main ones. You can also have a professional solve math problems or do your stats project for you. The website doesn’t say what academic levels and disciplines the services are designed for. Still, it won’t be wrong to assume that you can hire them if you are in high school, college or university, regardless which subject you need a paper for. There are write profiles on the website, but they contain only a short presentation written by each professional plus ratings and testimonials. There is no mention of the professionals’ qualifications, specialization or experience. There are no samples either. There are no fixed rates with this service provider. You will be able to choose from writers based on their bid for your order. You should check carefully what the price covers and ensure that you won’t incur any unexpected expenses. Another thing to keep in mind is that the lowest bid may not necessarily come with a sufficiently high quality. Since the writers offering their services on this website are independent, the company cannot covert their work with a guarantee. At least there isn’t one at the moment. Since the quality of your paper will depend entirely on the writer, you must request information about the professionals who you consider hiring and samples of their work also. There is no way to judge the writing quality objectively and thoroughly based solely on the writers’ profiles available on the website and this is something which all edusson.com reviews must point out. You can get support 24/7 via the online chat on the website. It is pretty reliable – you can expect a fast response. There is no phone number for speaking to a representative of the company directly and this is definitely a downside. You can send an email if your message is longer and you aren’t in a hurry. Is it a good idea to use the services of Edusson? It is safe to say that the experience with this website is strictly individual. The only way to get clear understanding of the quality and prices is to place an order and see what comes up. This naturally takes a bit of time and effort, but you can give the services a try. I was unlucky to get an unprofessional writer who was not very helpful. Will not use the service again as I don’t like playing the lottery of good and bad writers. Thanks for writing this review! Very interesting info!